The national recognition from the NHS Leadership Academy follows a landmark year for the trust which saw the opening of The Northumbria hospital. A healthcare trust is celebrating after earning prestigious national recognition. The board of Northumbria Healthcare NHS Foundation Trust received the recognition from the NHS Leadership Academy, winning NHS Governing Body of the Year at the NHS Leadership Recognition Awards 2016. The awards celebrate examples of outstanding leadership in the NHS which have had a positive impact on both patients and staff, and highlight best practice. The award for Northumbria Healthcare follows a landmark year for the trust after the opening of the Northumbria Specialist Emergency Care Hospital and transformation of urgent and emergency care. 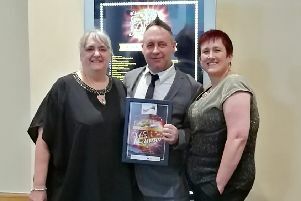 David Evans, trust chief executive, said: “We are delighted to receive this award after such an important year. “The changes we have made to improve patient care and open our new Northumbria hospital would simply not have been possible without the leadership of individuals right across our organisation. The award comes as a fitting tribute to Brian Flood, who was chairman of Northumbria Healthcare for 18 years and retired in February. “It is also a fitting tribute to Brian Flood who led the organisation with a real passion and dedicated his career to public services. Mike Chitty, head of applied leadership, NHS Leadership Academy, said: “The judges felt that in these very challenging times, it’s important to show that things need to be done with people not to them. “This team won because they demonstrated this element beyond doubt in both how they operate as a board and in the outcomes they achieve. As well as the regional and national awards, Northumbria Healthcare has also won the Board Leadership award at the Health Service Journal 2015 awards for its delivery of outstanding services, and was also named the Best Place to Work in the NHS in 2015.